The klipspringer (/ˈklɪpˌsprɪŋər/; Oreotragus oreotragus) is a small antelope found in eastern and southern Africa. The sole member of its genus, the klipspringer was first described by German zoologist Eberhard August Wilhelm von Zimmermann in 1783. The klipspringer is a small, sturdy antelope; it reaches 43–60 centimetres (17–24 in) at the shoulder and weighs from 8 to 18 kilograms (18 to 40 lb). The coat of the klipspringer, yellowish gray to reddish brown, acts as an efficient camouflage in its rocky habitat. Unlike most other antelopes, the klipspringer has a thick and coarse coat with hollow, brittle hairs. The horns, short and spiky, typically measure 7.5–9 centimetres (3.0–3.5 in). Typically nocturnal (active mainly at night), the klipspringer rests during the middle of the day and late at night. A gregarious animal, the klipspringer is monogamous to a much greater extent than other antelopes; individuals of opposite sexes exhibit long-term to lifelong pair bonding. The mates tend to stay as close as within 5 metres (16 ft) of each other at most times. Males form territories, 7.5–49 hectares (19–121 acres), in which they stay with their partners and offspring. Primarily a browser, the klipspringer prefers young plants, fruits and flowers. Gestation lasts around six months, following which a single calf is born; births peak from spring to early summer. The calf leaves its mother when it turns a year old. The klipspringer inhabits places characterised by rocky terrain and sparse vegetation. Its range extends from northeastern Sudan, Eritrea, northern Somalia and Ethiopia in the east to South Africa in the south, and along coastal Angola and Namibia. The International Union for the Conservation of Nature and Natural Resources (IUCN) classifies the klipspringer as Least Concern. There are no major threats to the survival of the klipspringer, as its habitat is inaccessible and unfavourable for hunting. Significant numbers occur on private farmlands. As of 2008, nearly 25% of the populations occur in protected areas throughout its range. The scientific name of the klipspringer is Oreotragus oreotragus. It is the sole member of the genus Oreotragus and classified under the family Bovidae. The species was first described by German zoologist Eberhard August Wilhelm von Zimmermann in 1783. The vernacular name "klipspringer" is a compound of the Afrikaans words klip ("rock") and springer ("leaper"). Another name for this antelope is "klipbok". A 2012 phylogenetic study showed that the klipspringer is closely related to Kirk's dik-dik (Madoqua kirkii) and the suni (Neotragus moschatus). The klipspringer evolved nearly 14 million years ago. The cladogram below is based on this study. O. o. aceratos Noack, 1899 : Noack's or southern Tanzanian klipspringer. Occurs in eastern and southern Africa, between rivers Rufiji and Zambezi. O. o. aureus Heller, 1913 : Golden klipspringer. Occurs in Kenya. O. o. centralis Hinton, 1921 : Zambian klipspringer. Occurs in central and southern Africa. O. o. oreotragus (Zimmermann, 1783) : Cape klipspringer. Occurs in the Cape of Good Hope, South Africa. O. o. porteousi Lydekker, 1911 : Occurs in central Africa. O. o. saltatrixoides (Temminck, 1853) : Ethiopian klipspringer. Occurs in the highlands of Ethiopia. O. o. schillingsi Neumann, 1902 : Maasai klipspringer. Occurs in eastern Africa. O. o. somalicus Neumann, 1902 : Somali klipspringer. Occurs in northern Somalia. O. o. stevensoni Roberts, 1946 : Stevenson's klipspringer. Occurs in western Zimbabwe. O. o. transvaalensis Roberts, 1917 : Transvaal klipspringer. Occurs in South African highlands and Drakensberg. O. o. tyleri Hinton, 1921 : Angolan klipspringer. Occurs in Namibia. The klipspringer is a small, sturdy antelope reaching 43–60 centimetres (17–24 in) at the shoulder. The head-and-body length is typically between 75 and 115 centimetres (30 and 45 in). It weighs from 8 to 18 kilograms (18 to 40 lb). The klipspringer is sexually dimorphic; females are slightly larger and heavier than the males. The tail measures 6.5–10.5 centimetres (2.6–4.1 in). Prominent facial features include the brown forehead, short ears marked with black, prominent preorbital glands near the eyes, and white lips and chin. The horns, short and spiky, present only on males, typically measure 7.5–9 centimetres (3.0–3.5 in); the maximum recorded horn length is 15.9 centimetres (6.3 in). The coat of the klipspringer, yellowish gray to reddish brown, acts as an efficient camouflage in its rocky habitat; the underbelly is white. Unlike most other antelopes, the klipspringer has a thick and coarse coat with hollow, brittle hairs. The incisors might even get damaged by the hairs while grooming. However, the coat is a significant adaptation that saves the animal during steep falls and provides effective insulation in the extreme climates characteristic of its mountain habitat. A study showed that ticks occur in larger numbers on the underbelly, where the hair is less coarse. The hair often turns erect, especially if the animal is ill or if its temperature increases. Another feature unique to the klipspringer is its gait; it walks on the tips of its cylindrical, blunt hooves. This enhances the grip on the ground, enabling the animal to deftly climb and jump over rocky surfaces. The subspecies vary in coat colour – from golden yellow in the Cape klipspringer, Ethiopian klipspringer, golden klipspringer and Transvaal klipspringer to ochre or rufous in the Maasai klipspringer, Stevenson's klipspringer and Zambian klipspringer. Cape klipspringer populations tend to have the largest males, while Maasai klipspringer exhibit the largest females. Typically nocturnal (active mainly at night), the klipspringer rests during the midday and at late night; the animal tends to be more active on moonlit nights. It basks in the morning sunlight to warm itself. A gregarious animal, the klipspringer, like the dik-diks and the oribi, exhibits monogamy to a much greater extent than other antelopes; individuals of opposite sexes form pairs that might last until one dies. The mates tend to stay as close as within 5 metres (16 ft) of each other at most times; for instance, they take turns at keeping a lookout for predators while the other feeds, and face any danger together. The klipspringer will hop a few metres away from the danger. Other social groups include small family herds of 8 or more members or solitary individuals. Klipspringer greet one another by rubbing cheeks at social meetings. Males form territories, 7.5–49 hectares (19–121 acres) large (the size depends on rainfall patterns), in which they stay with their partners and offspring. Males are generally more vigilant than females. Klipspringer form large dung heaps, nearly 1 metre (3.3 ft) across and 10 centimetres (3.9 in) deep, at the borders of territories; another form of marking is the secretion of a thick, black substance, measuring 5 millimetres (0.20 in) across, from the preorbital glands onto vegetation and rocks in the territories. A study revealed that the tick Ixodes neitzi detects and aggregates on twigs marked by the klipspringer. Another study showed that plants near the borders with neighbouring territories are particularly preferred for marking. The main vocalisation is a shrill whistle, given out be the klipspringer pair in a duet, as a means of communication or anti-predator response. Predators include the baboon, black-backed jackal, caracal, eagle, leopard, martial eagle, serval, spotted hyaena and Verreaux's eagle. Birds such as familiar chats, pale-winged starlings, red-winged starlings and yellow-bellied bulbuls have been observed feeding on ectoparasites of klipspringer. Primarily a browser, the klipspringer prefers young plants, fruits and flowers. Grasses, eaten mainly in the wet season, form a minor portion of the diet. Some plants, such as Vellozia, may be preferred seasonally. Klipspringer depend mainly on succulent plants, and not on water bodies, to meet their water requirement. They can stand on their hindlegs to reach tall branches up to 1.2 metres (3.9 ft) above the ground; some individuals in Namibia were observed climbing Faidherbia albida trees up to a height of 5.4 metres (18 ft). The klipspringer is a seasonal breeder; the time when mating occurs varies geographically. Females become sexually mature by the time they are a year old; males take slightly longer to mature. Mating behaviour has not been extensively observed. Gestation lasts around six months, following which a single calf, weighing slightly more than 1 kilogram (2.2 lb), is born; births peak from spring to early summer. Births take place in dense vegetation. The newborn is carefully hidden for up to three months to protect it from the view of predators; the mother suckles it three to four times a day, the visits gradually lengthen as the offspring grows. Males are protective of their offspring, keeping a watch for other males and predators. The calf is weaned at four to five months, and leaves its mother when it turns a year old. The klipspringer lives for around 15 years. Klipspringers inhabit mountainous regions with sparse vegetation. The klipspringer inhabits places characterised by rocky terrain and sparse vegetation. It migrates to lowlands at times of food scarcity. The klipspringer occurs at altitudes as high as 4,500 metres (14,800 ft) on Mount Kilimanjaro. The klipspringer can occur at high population densities in favourable habitats extending over a large area; 10 to 14 individuals occur per square kilometre in the Simien Mountains National Park, Ethiopia. However, the habitat is typically rocky over long stretches and grassy terrain is discontinuous; consequently the population density is typically between 0.01 and 0.1 individual per square kilometre. 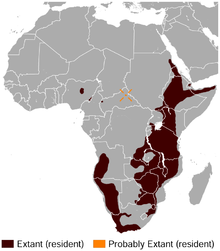 The antelope occurs in significant numbers across eastern and southern Africa; its range extends from northeastern Sudan, Eritrea, northern Somalia and Ethiopia in the east to South Africa in the south, and along coastal Angola and Namibia. Smaller populations occur in the northern and western highlands of Central African Republic, southeastern Democratic Republic of Congo, Jos Plateau and east of Gashaka Gumti National Park in Nigeria. It is feared to be extinct in Burundi. The International Union for the Conservation of Nature and Natural Resources (IUCN) classifies the klipspringer as Least Concern. The klipspringer is hunted for its meat, leather and hair. However, there are no major threats to the survival of the klipspringer, as its habitat is inaccessible and unfavourable for hunting. Moreover, the antelope does not have to compete with livestock, that do not frequent montane areas. However, populations at lower altitudes are more vulnerable to elimination. In 1999, Rod East of the IUCN SSC Antelope Specialist Group estimated the total population of klipspringer at 42,000. Significant numbers occur on private farmlands. As of 2008, nearly 25% of the populations occur in protected areas such as the Simien and Bale Mountains National Parks (Ethiopia); Tsavo East and West National Parks (Kenya); North and South Luangwa National Parks (Zambia); Nyika National Park (Malawi); Namib-Naukluft National Park (Namibia); and Matobo National Park (Zimbabwe). ^ a b c d e IUCN SSC Antelope Specialist Group (2016). "Oreotragus oreotragus". IUCN Red List of Threatened Species. IUCN. 2016: e.T15485A50191264. doi:10.2305/IUCN.UK.2016-1.RLTS.T15485A50191264.en. Retrieved 22 August 2016. ^ a b Grubb, P. (2005). "Order Artiodactyla". In Wilson, D.E. ; Reeder, D.M. Mammal Species of the World: A Taxonomic and Geographic Reference (3rd ed.). Johns Hopkins University Press. p. 686. ISBN 978-0-8018-8221-0. OCLC 62265494. ^ "Klipspringer". Merriam-Webster Dictionary. Retrieved 7 April 2016. ^ Johnston, A.R; Anthony, N.M (2012). "A multi-locus species phylogeny of African forest duikers in the subfamily Cephalophinae: evidence for a recent radiation in the Pleistocene". BMC Evolutionary Biology. 12 (120). doi:10.1186/1471-2148-12-120. PMC 3523051. PMID 22823504. ^ a b c d e f g h i j k Kingdon, J. (2015). The Kingdon Field Guide to African Mammals (2nd ed.). London, UK: Bloomsbury Publishing. pp. 588–9. ISBN 978-1-4729-2531-2. ^ a b c d e f g Castelló, J.R. (2016). Bovids of the World: Antelopes, Gazelles, Cattle, Goats, Sheep, and Relatives. Princeton, US: Princeton University Press. pp. 224–44. ISBN 978-1-4008-8065-2. ^ a b Groves, C.; Grubb, P. (2011). Ungulate Taxonomy. Baltimore, US: Johns Hopkins University Press. pp. 275–9. ISBN 978-1-4214-0093-8. ^ a b c Stuart, C.; Stuart, T. (2001). Field Guide to Mammals of Southern Africa (3rd ed.). Cape Town, South Africa: Struik Publishers. p. 214. ISBN 978-1-86872-537-3. ^ a b Liebenberg, L. (1990). A Field Guide to the Animal Tracks of Southern Africa (Illustrated, reprint ed.). Cape Town, South Africa: D. Philip. pp. 273–4. ISBN 978-0-86486-132-0. ^ a b c d Mills, G.; Hes, L. (1997). The Complete Book of Southern African Mammals (1st ed.). Cape Town, South Africa: Struik Publishers. p. 264. ISBN 978-0-947430-55-9. ^ a b Hart, L.A.; Hart, B.L. ; Wilson, V.J. (1996). "Grooming rates in klipspringer and steinbok reflect environmental exposure to ticks". African Journal of Ecology. 34 (1): 79–82. doi:10.1111/j.1365-2028.1996.tb00598.x. ^ a b Dunbar, R. (1984). "The ecology of monogamy". New Scientist (1419): 12–5. ^ a b Dunbar, R.I.M. ; Dunbar, E.P. (1980). "The pairbond in klipspringer". Animal Behaviour. 28 (1): 219–29. doi:10.1016/S0003-3472(80)80026-1. ^ Dunbar, R.I.M. ; Dunbar, E.P. (1974). "Social organization and ecology of the klipspringer (Oreotragus oreotragus) in Ethiopia". Zeitschrift für Tierpsychologie. 35 (5): 481–93. doi:10.1111/j.1439-0310.1974.tb00462.x. ^ Apps, P. (2000). Wild Ways : Field Guide to the Behaviour of Southern African Mammals (2nd ed.). Cape Town, South Africa: Struik Publishers. pp. 157–9. ISBN 978-1-86872-443-7. ^ Rechav, Y.; Norval, R.A.I. ; Tannock, J.; Colborne, J. (1978). "Attraction of the tick Ixodes neitzi to twigs marked by the klipspringer antelope". Nature. 275 (5678): 310–1. doi:10.1038/275310a0. ^ Roberts, S.C.; Lowen, C. (1997). "Optimal patterns of scent marks in klipspringer (Oreotragus oreotragus) territories" (PDF). Journal of Zoology. 243 (3): 565–78. doi:10.1111/j.1469-7998.1997.tb02802.x. ^ a b c d Skinner, J.D. ; Chimimba, C.T. (2005). The Mammals of the Southern African Subregion (3rd ed.). Cambridge, UK: Cambridge University Press. pp. 708–11. ISBN 978-0-521-84418-5. ^ a b c d East, R.; IUCN/SSC Antelope Specialist Group (1999). African Antelope Database 1998 (Illustrated ed.). Gland, Switzerland: The IUCN Species Survival Commission. pp. 298–301. ISBN 978-2-8317-0477-7. ^ Mares, M.A. (1999). Encyclopedia of deserts (Illustrated ed.). Norman, US: University of Oklahoma Press. p. 324. ISBN 978-0-8061-3146-7. "Klipspringer" . Encyclopædia Britannica. 15 (11th ed.). 1911.